“First Execution in Washington: James McGirk,” Histories of the National Mall, accessed April 22, 2019, http://mallhistory.org/items/show/158. James McGirk, also spelled McGurk, was hanged on October 28, 1802, near the Capitol in the same area today occupied by the statues of Presidents Garfield and Grant. He was the first person executed in the District of Columbia. 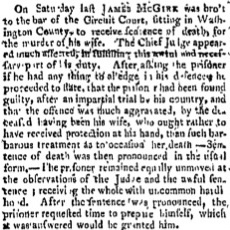 In April 1802, McGirk was convicted of having beaten his wife to death shortly after she delivered stillborn twins; newspapers speculated that his repeated physical abuse may have contributed to the infants' death. Appeals to President Jefferson by McGirk and his lawyer for a stay of execution were unsuccessful.